When he kills the Strv m/42, the tank is NOT red, in fact the tank is likely behind a destructible object like a fence / wall or building but he locks and fire for a kill shot. You can pause the video right at the moment when he locks and clearly see the tank is NOT highlight. In fact you can't even see the tank as it is either too small or behind an object. Don't kid yourself, there are still a lot of mod users out there and we can never really know if this guy is cheating or not. The only way is if WG continues to build algorithms to detect these things. how many of your own replays have you recorded to mp4 or other format, and then examined closely? weird things happen, especially if the person running the replay decides to change camera views. 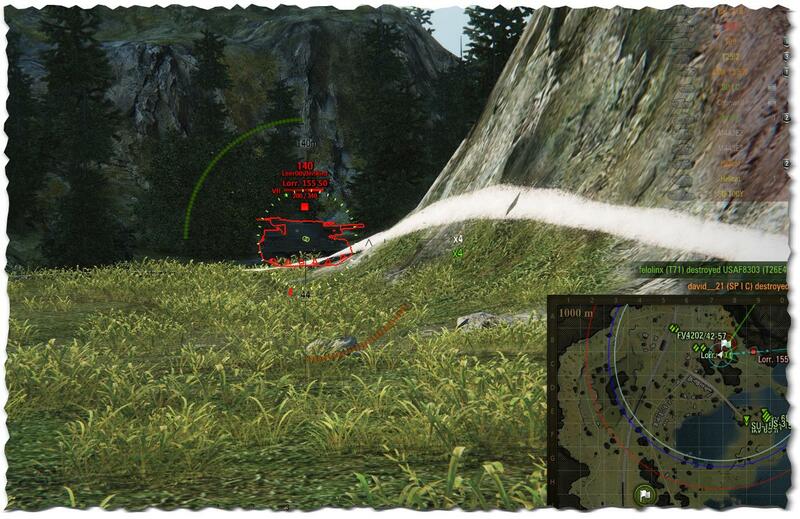 There was a guy in a Caernarvon last night in one of my tier 7-9 battles that was pretty clearly using Aimbot. He was penning everything and anything without aiming--his turret would spin around on a tank that was 95% obscured by cover and magically hit the commander's hatch, or he would be driving along a shoot the LG of a tier 9 tank even though that tank was hull-down on a hill. He wasn't taking any time to aim, just firing off snap shots and shredding everyone. It was pretty obvious what was going on. WG should just disable all the mods. Then it goes back to a level playing field and no one has to worry about cheating. If we want win8 in the interface, they can add it. WG will continue losing players until they do this, although I have been told by some guys that WG is actually selling the illegal mods on the side. I don't know if that is true--I certainly hope not. replay or it didn't happen. Sounds more like a mountain of exaggeration. Of course, to the average scrub anything a skilled player does looks like a hack. You sound just like the minecraft whiners every time they get beat by my son, "UR a hacker!"